I rarely share recipes here, but I wanted to share the one I made yesterday so that I can find it again. I will surprise you next week with a post about ART. On Thursday I made a Balsamic Pot Roast recipe. It was all right. Too balsamic-y, and missing some onion flavor. I made it because of the fabulous photo the blogger used. I decided to try again on Friday, and looking at several recipes, came up with this combo, which is very good! The bread is important, these rolls are made by the Brick Oven Bangor Rye Bakery and are my favorite rolls to buy. Sprinkle Lowry's seasoning salt on the roast top and bottom. Then brown the roast in a skillet on both sides till the meat is mahogany colored. I did this on medium high in a cast iron skillet. While the roast is browning, boil the beef broth until it is reduced in volume by half. 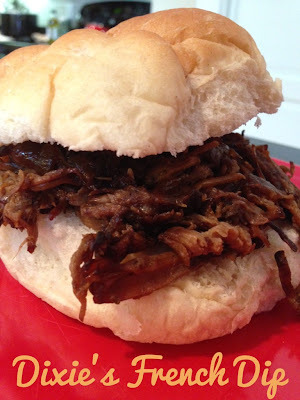 Cut onions into thick slabs and place on bottom of crockpot or slow cooker. You can leave them in slabs, or break them apart into rings. When roast is browned, put in on top of onions in the crockpot. Add the bay leaf. Mix the rest of the ingredients into a sauce and pour over the meat. Set the crockpot to LOW, cover it and do other stuff for 7-9 hours. Remove meat, shredding with two forks. Pour juices into a liquid fat separator, and save the juices, discarding the fat. Put on Brick Oven rolls with Gouda cheese and your choice of condiments and some of the juice to dip the sandwich in. Serve with a salad and this wonderful Green Goddess Dressing, but substitute plain greek yogurt for the sour cream to save on calories. This sounds soo good. MMM I love French dip!